I like to work with a variety of techniques and styles. Stones, crystals, seed beads. I love how you can take seed beads and turn them into anything. With so much variety in stitches and patterns, it never gets boring. 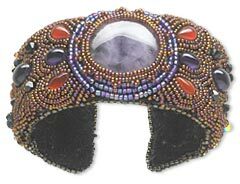 I called it My First as it was my first beaded cuff and my first contest to Fire Mountain Gems. I had been wanting to make an embroidered cuff for a while and really wanted to use this amethyst stone I had. I'm not much of a planner. I usually have a hard time picking out colors, but this time everything just seemed to fall into place. I've always liked Native American beadworks, so in my early 20s I took a class on loomwork that the Oneida Nation was offering. I basically introduced myself when I took the class on loomwork, but they also had a bead circle group and I met a woman there who introduced me to a whole new world of beadwork. No, but I have always had an interest in beadwork. Through other bead artists I have met. Yes. I go to two bead groups. One is at the Oneida Education Center and another meets every Wednesday at the Goodwill store. I barely have any free time, so for now it is a hobby, but it is absolutely fun making one of a kind jewelry and gifts. I don't do any of those things, as my time is so limited. This is my second contest. You can do it. So many beginners say ''I can't'' or ''I'll never be that good,'' and once they find some stitch they love, they find that they can.